Making quilts out of used clothing dates back to the very origins of quilt making. Our ancestors, ever frugal and economical, re-purposed the usable fabric from cast-off garments to create warm and functional patchwork bed coverings. Today, making quilts from old clothes has less to do with thrift and more to do with remembrance. T-shirt quilts are all the rage; search the internet for “necktie quilts” and you will be amazed at the results! As they say at Custom Memory Quilts – a site devoted to this very thing – memory quilts are a great way to memorialize a loved one or to make use of clothing outgrown by a child. 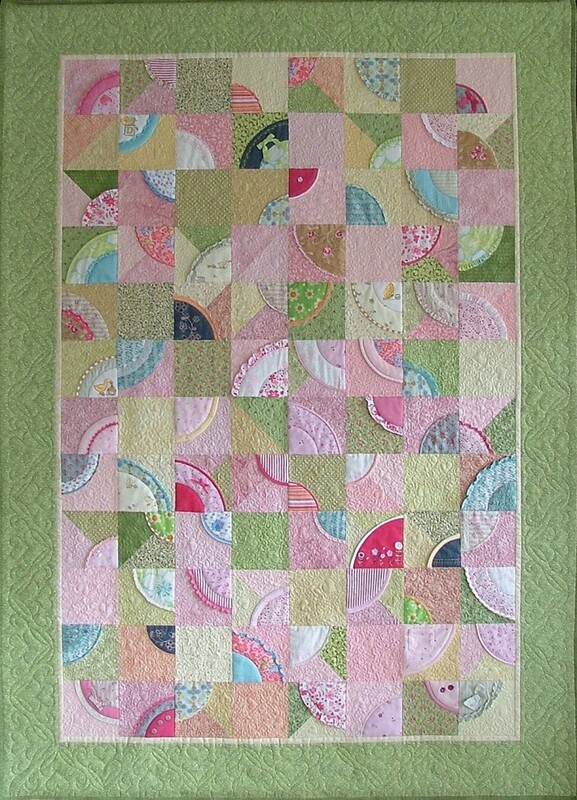 My first memory quilt was made in 2008 on commission, using fabric from the baby clothes of my client’s daughter. 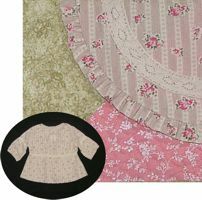 The garment fabrics are featured as quarter-circle patches appliquéd onto cotton background squares and the curved seams are embellished with lace, ruffles, and trim. 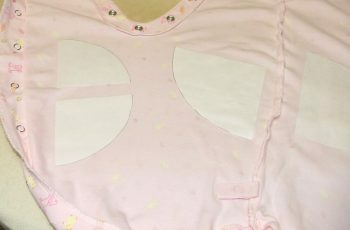 I traced and cut out quarter-circle templates from freezer paper, then ironed them onto the wrong side of the garment. 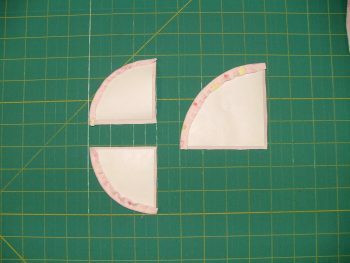 The fabric was cut out and the curved seam allowance was basted to the freezer paper. 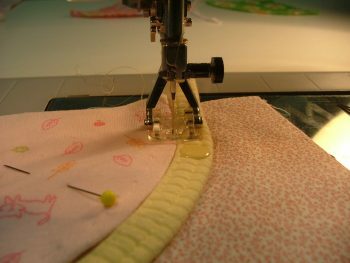 The quarter-circle patches were machine appliquéd onto cotton background squares, often with a trim added to the curve. I had a lot of fun taking each garment and turning it into a quilt block, incorporating elements like smocking or embroidery, or combining fabrics from multiple outfits. I called the completed quilt Butterfly Kisses. Just like the song with the same name, the quilt pays tribute to a darling little girl growing up too fast. Complete instructions for making the quilt are available in a downloadable epattern. This little girl has a brother and their mother has saved all his baby clothes too. Stay tuned to see what his memory quilt looks like!